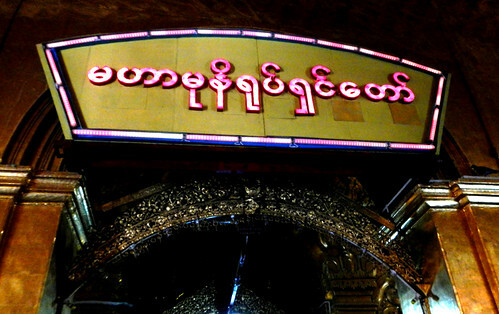 Soft pink neon glows above the entrance to the Mahamuni Pagoda in Mandalay. 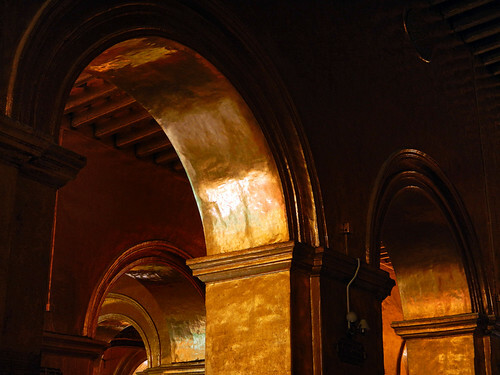 The walls are all covered in gold causing the rooms to glow. 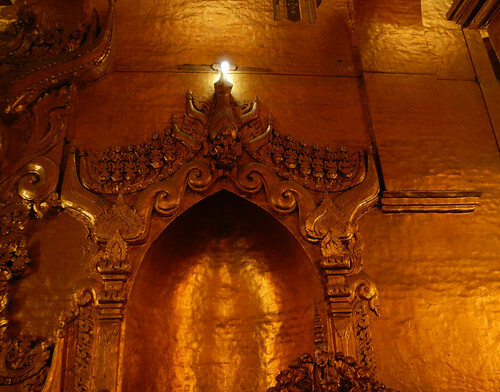 The golden rooms lead to the golden Buddha. 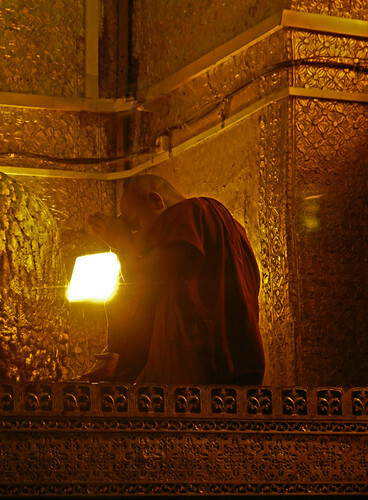 Monk praying to the golden Buddha. Two men applying gold leaf to the Buddha, who has so much gold applied to him he is lumpy with gold. 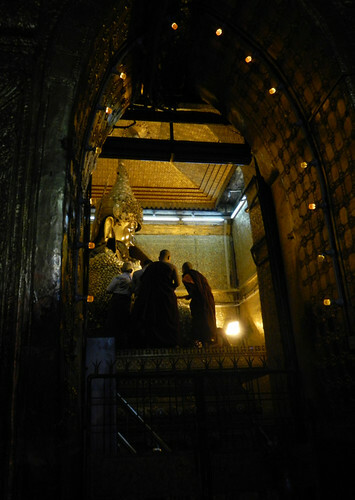 Women are not allowed to get close enough to the Buddha to apply gold leaf; this is a privilege restricted to men only. Because of the restrictions on women only Al was allowed to get a close-up shot of the Buddha. 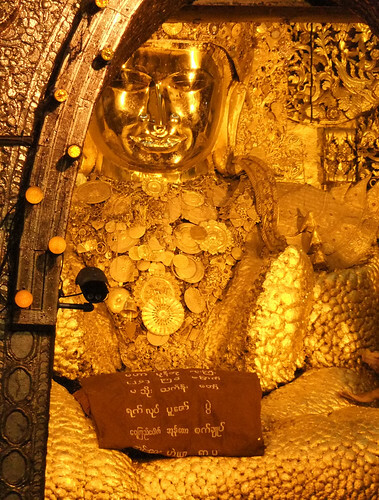 I think the restriction had to do with the fact that in order to apply the gold one had to touch Buddha’s body, and that went against some principle or another. 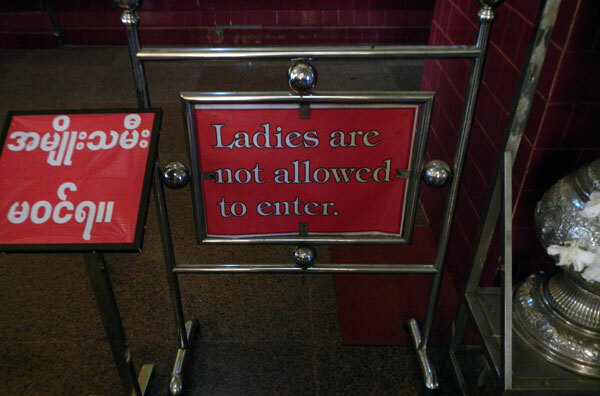 It was the only place in the country where women were restricted. It’s well worth it, and I would say go fairly soon. It’s still a bit difficult to get around: travel infrastructure is not really there – airlines are not yet able to handle credit card transactions), wifi is extremely iffy, it was more expensive than we expected, cash is king, and there are only about four ATMs in the entire country. On the other hand, the people have a wonderful innocence and spirituality to them, and the country and beaches are unspoiled.